My skin isn't oily so why do I get a shiny face? What causes shiny skin? My skin isn’t oily but I still get a shiny face? There is a fine balance between glowing skin and a shiny face. One makes you look radiant and healthy. The other makes you look like a glitter ball. Clients of all genders can complain of a greasy complexion, and this can make the flawless application of foundation challenging, requiring oil blotting paper and anti-shine powders to remove excess oil. These products are all designed to reduce sebum levels and make the skin appear more matte. The likelihood of having a shiny face is higher in all climates if a client has oily skin and an oily T-zone. However, what if you don’t have oily skin but you still get a shiny face? Is this even possible, or will you always find oil where there is shine? The answer is that it’s possible to have shiny skin without having an oily complexion. In this article we will explore the possible causes of shiny skin and solutions to help reduce unwanted shininess. The first step is to assess the client’s primary skin type. Do they have oily skin? The most accurate way of assessing this is to work with a certified skincare practitioner who can asses the level of oiliness using diagnostic equipment that measures sebaceous activity. A black light tool called a Woods Lamp easily detects sebum levels within the pore, even after cleansing. The results are often surprising, running contrary to first impressions made when examining the skin under a magnifying lamp. The second method is using oil blotting papers. Press oil blotting papers onto the skin after 30 minutes of cleansing. If you see oil on the sheets then the client has an oilier skin, otherwise they may have more of a dry skin. This method is obviously not as accurate as a professional skin analysis but it may help determine whether excess sebum is contributing to your client’s shiny face. Once you have determined sebum production and ruled it out as a contributing factor to a shiny face. The next stage is to look at the other possible causes. Secretions – Sebum is not the only substance our skin secretes on to the surface. Sweat is also secreted and along with sebum forms the skins ‘Acid Mantle’. Some people naturally have a warmer complexion. It may be hormonal, medical, emotional (anxiety) or environmental i.e. living in a warmer climate. If the skin “feels” oily, but after accurate skin analysis is found not to “be” oily. Then chances are excess sweat may be part of the problem causing your face to be shiny. Over-Exfoliation – If, on the other hand, the skin feels dry and / or tight, then exfoliation may be the leading cause. We all know that a little exfoliation can leave us with radiant glowing skin. This is because younger skin cells called keratinocytes naturally reflect light better than older corneocytes. However if you over-exfoliate you compromise the skins natural barrier function. This leads to an increase in trans-epidermal water loss (TEWL) and a tight feeling within the epidermis. The combination of light reflective cells, stretched over a smooth surface, makes the skin appear shinier. How to reduce a shiny face? Once you’ve established if over-exfoliation is part of the problem. The obvious solution is to reduce how often and what methods you use to exfoliate your skin. If you’re currently using physical exfoliators including scrubs, wash cloths or ultrasonic cleansing brushes then consider cutting back on these. Switch to an enzyme exfoliating mask once a week. 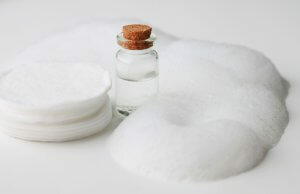 Enzymes are gentler on the skin than abrasive scrubs and brushes. The latest technological developments in dermatology have led to the creation of a new skin sonic cleansing device. Made by a Swedish company called FOREO, the LUNA has silicone touch points instead of a circular brush. These are proven to be a lot gentler on the skin’s surface and don’t cause any irritation. The deep clean, removes more oil, grime and dirt than washing with hands alone. Vitamin A is a key nutrient that helps to regulate skin cell turnover and repair skin barrier function. Using a Retinol serum can help encourage natural desquamation, giving an exfoliating effect without need for skin scrubs. Vitamin A also helps to regulate sebum production, offering benefits whether excess sebum is part of the problem or not. Aside from giving you a shiny face there is another reason it’s important to avoid over-exfoliation. Aggressively exfoliating the skin on a regular basis causes the natural barrier function to break down. This leads to all sorts of secondary skin concerns. Typically irritated skin will be sensitive, lines and wrinkles may also become more pronounced. More frequently client experience an acne breakout! The combination of a lack of water in the epidermis affects the skin’s ability to naturally desquamate. This is because the protease enzymes need water to function. So, while you’re exfoliating the skin’s surface, you may be causing a build up of keratinised cells within the follicle. Combined with the lack of sebum secretions on the skins surface, sebum is the primary food source for the P. acnes bacteria. Therefore, if the food supply on the surface of the skin is scarce, the bacteria will migrate towards the pilo-sebaceous duct in search of food. If sebum is broken down in to fatty acids within the follicle, it causes inflammation leading to papules and pustules. Skin dehydration is linked to poor exfoliation and blocked pores. In most cases, it’s necessary to re-educate clients on the importance of gentle exfoliation. The secret is learning how to do so whilst preserving the integrity of the stratum corneum and its ecosystem. For more information on this, see this CPD accredited article for a simple explanation on how to maintain the integrity of stratum corneum. 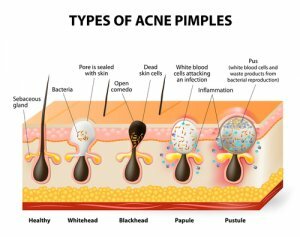 Clients with acne can easily get into a vicious cycle. They rely on foundation to cover breakouts, and that foundation results in poor skin health. For these clients, it is vital to avoid using liquid foundations that are made with irritating ingredients. Because these aggravate and lead to oiliness and shine. Two key irritating and cosmogenic ingredients to look out for are Butyl Stearate and Oleyl Alcohol. Fortunately, many company have developed makeup that’s safe for all skin types and anti-cosmogenic. A far better alternative to regular liquid foundations is a 100% mineral and organic makeup. The formulation is free from any irritant including talc. Typically the sunscreen rating is around SPF 28. Australian made mineral makeup Inika is a superior quality product and is sold worldwide. Advanced Practitioners can help their clients with achieving significant improvements. Learn from the MB Institute how to successfully treat shiny skin using a combination of unique homecare and treatments made with active ingredients. We provide training that enhances the confidence and treatment abilities of skin care professionals. Gain expert knowledge and become certified in a skin analysis method using the Medico Beauty 7 Point System, and learn how to successfully diagnose the root causes of skin problems and create an effective treatment plan. If you wish to learn more or enquire about advanced skin training in the safe use of Metabolic Peels, contact us to speak with a representative about how training can help you T: 0844 855 2499 or email [email protected]. We strive to keep all our articles relevant. If you know of a vital new discovery about shiny skin causes and treatments, please let us know by leaving your comments below! And, finally, please like and share with your friends.